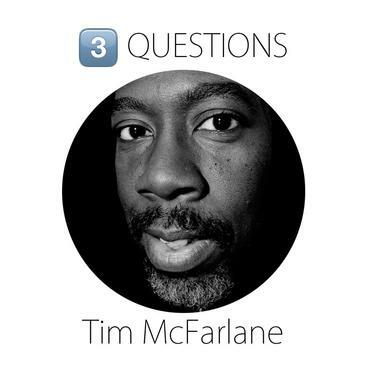 After featuring him on Your Daily Bread the other week, I really wanted to learn a little more about @timmcfarlaneart. I reached out to him and he was gracious enough to take some of his time to answer a few questions. One: Your work explores time - relationships between past and present and how the passage of time alters perception. Does being in Philadelphia - a historical city by American standards - inform your work and if so, how? I was born and raised in Philadelphia, so its history and place in America's story is pretty much ingrained my psyche, no matter how much I try to not think about it. I started painting in high school and even then, I was thinking about how to move beyond the grip of Philly's artistic legacy of realism that it was known for. Even though at that time I was just learning the basics of painting via figurative drawing and painting, still life and landscape work, I was beginning to also look beyond that history and sought ways to rebel against it. I didn't quite know how to do that at first, but during my days as an art student at Temple University, I learned more about non-objective painting and knew that's what I wanted to pursue. I was looking to find a mode of expression that went beyond the known physical world and explore themes without what I considered the baggage of realism and the instant associations that viewers make with it. I wasn't interested in re-creating what was there already; I was much more interested in issues that transcend objects, appearances or ascribed meanings. Two: Modern society with it’s ephemeral tastes and constant craving for the new and latest “thing” whether it’s the new watch, latest picture of food to throw up on Instagram, or YouTube celebrity - as an artist: rich canvas to celebrate or sad state to rage at with art? My opinions fall somewhere in the middle of that spectrum. I'm not a fan of how consumerist culture inserts itself into our lives, but we can control what we take on and engage in, at least. There are aspects of evolving tech, pop culture and their effects on people's behavior that I often find myself gnashing my teeth at, but I don't hate all of it. One thing that I find annoying is the proliferation of art viewers who seem to only take photos of or selfies with art, but barely spend a few seconds actually looking at and studying the art itself. The short attention given to most art isn't new, but it has gotten pretty bad. As someone who practices one of the oldest technologies in the known world, painting, it can be a little disconcerting, and sad, at times, to see how little time many viewers will spend with a work of art. Instant sharing of photos via apps like Instagram (IG) can exacerbate the problem because many people who may live in the same city as the exhibition won't go to see the work first-hand because they feel like they've experienced it already via their phones. I argue that people who have that mindset are sadly mistaken and missing out on a non-mediated experience of art. On the other hand, that hasn't stopped me from embracing tech as a way of gaining more visibility for my work and to connect with artists, institutions, and others from all over the globe. It's a double-edged sword, but I like to make the most of whatever it is that I can control and let the rest fall by the wayside. Three: Your ello avatar is genius - layer upon layer of you, with an electronic twist. You’re goddamn consistent with the layers thing. When you’re not thinking about your art, how do you unwind and recharge. Haha, thanks! Honestly, I'm thinking about my work almost all of the time. If I'm not physically making it, there's always a bunch of issues, ideas, and other things connected with it in the back of my mind. However, unwinding and recharging can involve binge-watching of a favorite tv show to catch up. I did that recently with season four of "The Walking Dead". Went through it in one weekend, lol. It wasn't the best thing with that show because the tension is always so amped up on that show. I also bike a lot, work out, go to movies once in a while, read graphic novels and other books, listen to music constantly, spend time with my wife and try to hang out with friends, when we can carve out the time.